Last weekend, Open Concept Gallery hosted their Annual SMart Festival Media festival. Chances are, you didn’t know about it. And if you happened to stumble on their Facebook page or received an email from them, you may have been confused about what the show actually entailed. This kind of vague obscurity has become par for course with Open Concept Gallery. And we’re not talking about Johnny Depp vague-cool. Despite this being an annual festival, nothing was posted on their website. Instead, the page that advertised the event came from an events marketing company that made two things very plain: you could donate on the page, and the event was a fundraiser. The other information about the work came as a mile-long list of types of works and themes that would be covered in this six-exhibition show. Yes, SIX exhibitions. They made it sound like, well, a festival, if not a carnival. And the opener was a bit festive, if you like sad clowns. On the way to the gallery space, I shared an elevator with a lollipop-licking man slumped in the corner and wearing a hoodie and black and white face paint. Perhaps I was so delighted by the cherry candy smells that I failed to ponder what Open Concept touted as the “social, cultural, and political issues” raised by Detroit artist, Sartori Circus. Maybe he did raise a social consideration, as I concluded that I wouldn’t want my children near this man– and I promise, I’m not anti-hoodie. Open Concept recently said goodbye to this beautiful space. Their future site remains to be determined. I was largely motivated to attend the opening to get a last glimpse of Open Concept’s stunning space before they relocated. However, when I stepped out of the elevator, I found myself in a corporate office space with industrial carpet, low ceilings and late 90’s sconce lighting. For unknown reasons, the gallery wasn’t able to continue their lease for the show, so they temporarily relocated to another floor. It’s an unfortunate situation, and out of compassion, I won’t discuss how the dim lighting and sage green office walls did a terrible disservice to the work displayed. I wish I could say they did the best with what they had. Artist statements replete with misspellings and typos were peeling away from the wall. Interactive pieces bore no indication that they were interactive except when gallery director, Zora Carrier would enthusiastically swoop in to demonstrate. When I was watching, the voice-triggered video game was unresponsive. Perhaps the most awkward display was the silent auction items that resembled a lost-and-found dumped onto plinths. Visitors could bid on items ranging from pencil bags to perfumes. Included in the mix were several pieces of art labeled by “unknown artist,” yet one of these was unmistakably the work of local printmaker Alynn Guerra. This oversight by Zora and her large staff seems to indicate that either the gallery is out of touch with the local art community, or what is worse in my opinion, they simply don’t care enough to do the work to provide transparent information. 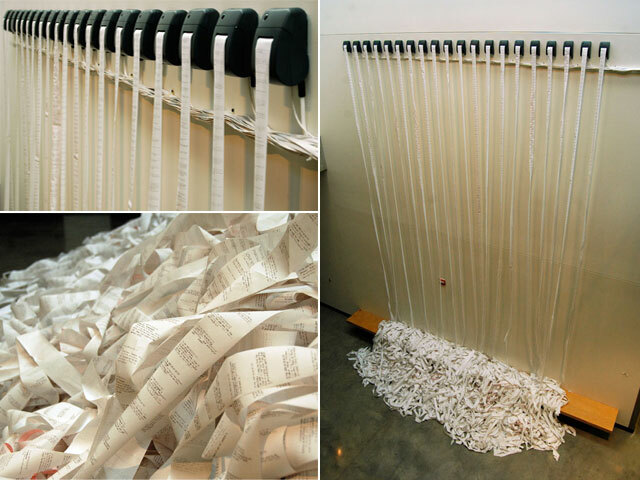 I would be amiss if I didn’t mention the truly innovative and timely works at the show, such as Christopher Baker’s Murmur Study, in which receipt printers continuously spit out printouts of live Twitter and Facebook feeds filtered by emotional utterances such as “meh, grrrr, and ewww.” The receipt-printers with their constantly generated stream are modern day stand-ins for turn-of-the-century ticker tapes—a humorous commentary that links the personal broadcasting that takes place in social media to fluctuating economic patterns. an excerpt from Dan Swartz's "The Gay Corner"
Unfortunately, intelligent works such as this were framed by cheap, shoddily executed one-liners, particularly the work by “United in Difference” artists, a label apparently given to artists whose work dealt with gender and sexual identity. 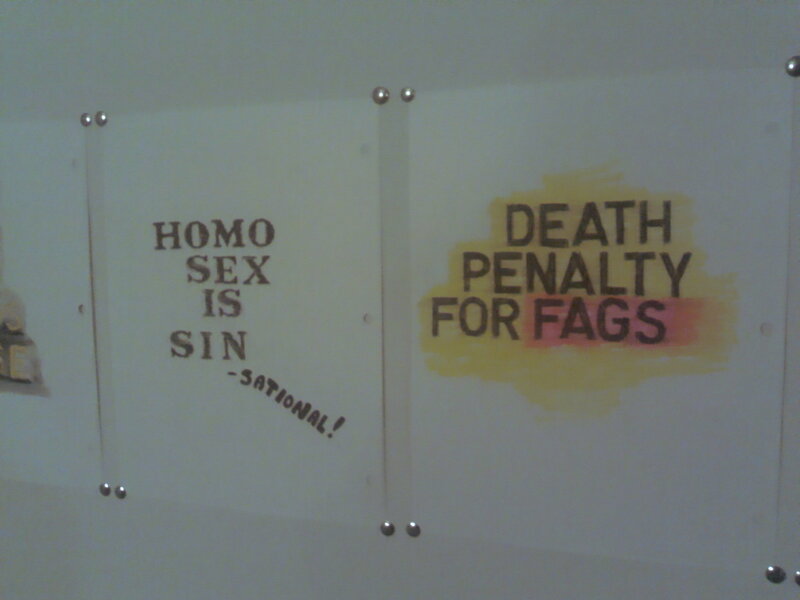 Dan Swartz’ “The Gay Corner” consisted of construction paper cutouts and stenciled lettering and stars that spelled out homosexuality-damning phrases like “Don’t be gay in God’s house,” and “Death penalty for fags.” While the work offers some basic irony, it could be accused of the same crime as Tavonatti’s ArtPrize-winning “Crucifixion”: pandering. I’m not questioning either artists’ sincerity of belief or message, but both present charged subject matter in a stale manner devoid of visual freshness or conceptual astuteness. This show’s scatter-brained curating and confused marketing would get a pass if it didn’t come from the gallery that has brought us Dennis Oppenheim and David Cerny’s “Man Hanging Out.” This isn’t a gallery in its infancy, and they’ve taken some admirable risks in the past that have delivered substantive work. Knowing what they’re capable of, I can only hope that in their new physical location, Open Concept won’t be such a misnomer. ← Detroit Forsaken…or is it?